The first horses on Sable Island, off the coast of Nova Scotia, Canada were brought to the island during the late 1700s. Many people believe that they arrived on the island from many shipwrecks. However, this romantic notion is false - they were in fact intentionally left on Sable to graze and multiply, and were most likely seized from Acadians during their expulsion from Nova Scotia at the hands of the British. Although often referred to as ponies due to their small size, they have a horse phenotype. One of the first horses on the island for which there was a record of importation was the stallion, Jolly, who was taken there in 1801. Their ancestry is unknown, but they are related in some way to Spanish horses. The horses that remain on Sable Island are feral, but in the past, those exported to the mainland were tamed to ride, and said to be excellent, tough and enduring, and able to travel with ease on any terrain. 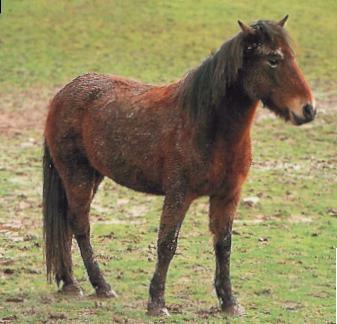 Present day horses are all very hardy and thrive in an inhospitable environment. The herds are not managed, nor subject to human interference and so exhibit a range of characteristics. In general, they have nice heads with a straight or convex profile and are short, stocky and muscular in frame. Their coats are mostly dark colors, but some do exhibit white markings. There are no grays.